This might be the best holiday season ever for the Bisaga Family of Saint John, IN. That’s because the family was treated to a Chicago Bears “Dream Come True” event in partnership with Advocate Children’s Hospital to celebrate 13-year-old Andrew Bisaga who is in remission from osteosarcoma (bone cancer) after being diagnosed just over a year ago during the start of his own football season. On Monday, December 10, the Bisaga Family was picked up at their home by a limo and escorted to Halas Hall, the Chicago Bears’ headquarters in Lake Forest, for a day full of surprises. 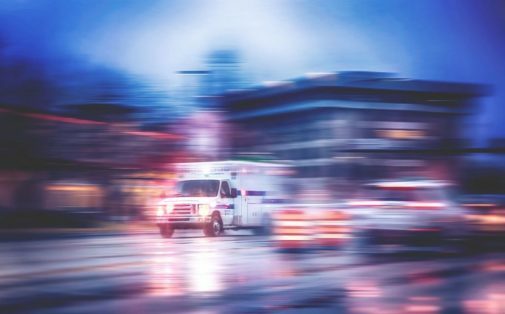 Andrew’s mom, Mary, was in on the secret, but the rest of the family, including Andrew’s younger’s brothers, Ethan and Max, had no idea what was in store for them. 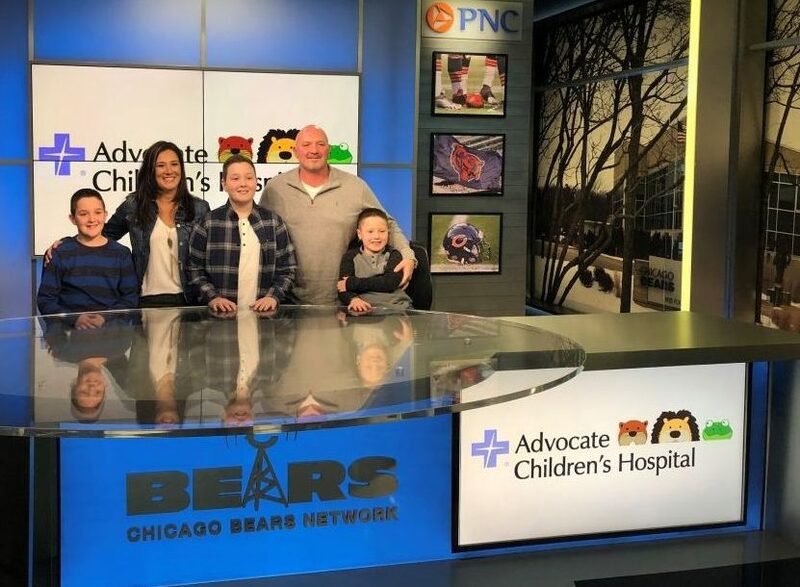 Advocate Children’s Hospital and the Bears together organized the VIP holiday experience to lift the Bisagas’ spirits and celebrate an end to a previous tumultuous year with Andrew undergoing months of chemo and a tough surgery. Upon their arrival to Halas Hall, the family was enthusiastically greeted by linebacker Sam Acho, Chicago Bears Monster Squad, Drumline and Staley da Bear. From there, the Bisagas were surprised with a meet and greet with players Mitchell Trubisky, Chase Daniel and Jordan Howard. 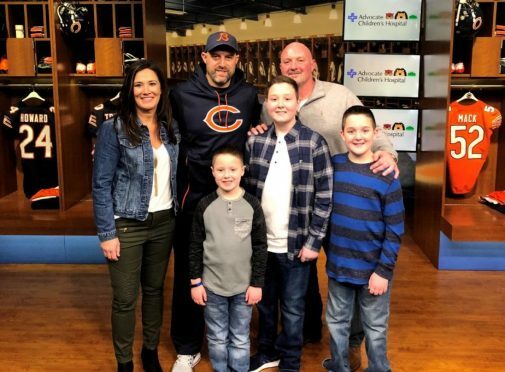 They then headed to the Bears studio where they were surprised by Head Coach Matt Nagy. Andrew hopes to one day go into coaching and was able to ask Coach Nagy a few of his winning secrets. Finally, the Bisagas enjoyed a holiday lunch with players Anthony Miller and Taylor Gabriel where they presented a number of presents to Andrew, including tickets to this weekend’s Chicago Bears game against the Green Bay Packers, Bose headphones, a Nike gift card, Madden NFL 19 video game and Bears jerseys. Andrew, a Bears fan and former football player, was speechless by the end of the day. Andrew was an active 12-year-old boy when he was diagnosed with osteosarcoma in November 2017. 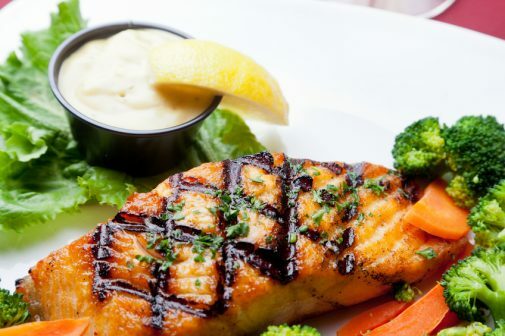 He had just finished soccer season and was in the middle of football season when he began experiencing pain in his leg, which was initially attributed to a groin injury, which is a common football ailment. After the pain didn’t subside, his parents brought him in for an x-ray, which led to a subsequent biopsy, and finally the news his parents never hoped to hear – a diagnosis of osteosarcoma. 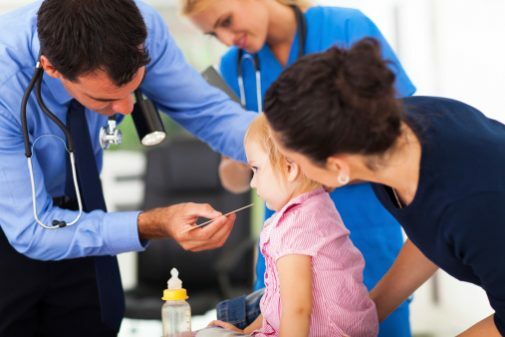 Despite living in Indiana, his parents chose for Andrew to undergo cancer treatment at Advocate Children’s Hospital in Oak Lawn, Ill., where he became a favorite of many physicians, nurses and child life specialists. This past July, he finished all rounds of chemotherapy and is in remission! While Andrew can never play football, or any impact sport, again, he has remained part of his school’s sports team as manager and hopes to coach one day. This day will be something Andrew and his family will forever cherish. Watch a recap of the heartwarming day here. ← Rudolph’s red nose explained – but what’s the cause of yours?